Do you have a Future Alum to recognize? Use the form below to submit their birth announcement within a year of birth. After we receive your submission we’ll send an "O Baby!" t-shirt and a certificate for the Future Alum. We'll also publish the good news in an upcoming issue of UNO Magazine and on our web site. 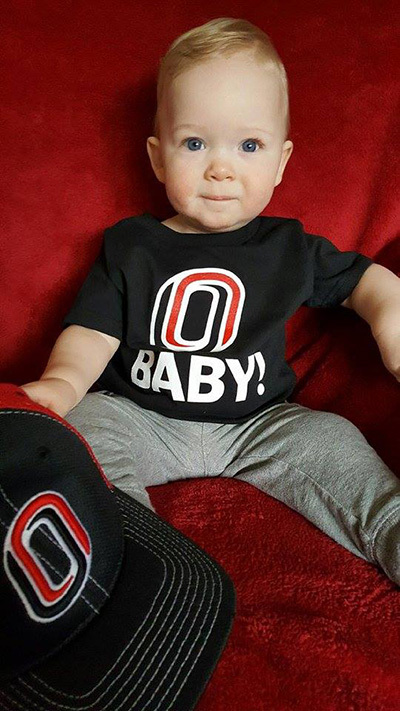 The UNO Alumni Association in the summer of 1991 established a birth recognition program for the children of graduates, issuing Future Alum certificates and bibs to newborns and announcing their arrival in the UNO Alum magazine. Shirts now are issued and most submissions come via email or through a Web form, but the babies have kept coming. To date, the association has recognized more than 2,000 Future Alums in the program’s 25 years. About a dozen one-time Future Alums are currently enrolled at UNO. Top: Keenan Matthew Brooke, son of Michelle and Skyler Brooke. Skyler has a 2014 and 2016 degree and is Assistant Director of Strength, Fitness and Personal Training in School of HPER.